It was pure pleasure selecting the orchids for the giant shimmering rings suspended above the Formal Bed in the Orchid Display House. 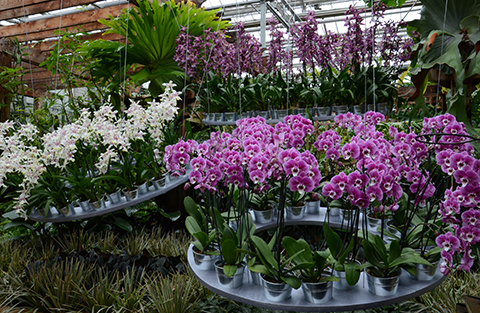 When you are working with a palette of cool colors the choice of orchid varieties expands enormously. Phalaenopsis are an obvious choice for any orchid display, with their graceful arching habit, large flowers and amazing longevity. The Doritaenopsis in our display are an intergeneric cross between Phalaenopsis and Doritis, two orchid genera so closely related as to be considered synonymous by some taxonomists. Doritaenopsis Long Pride 'Sparks' HCC/AOS is one of the most beautiful harlequin varieties that we have ever featured in our display--certainly worthy of the spotlight. 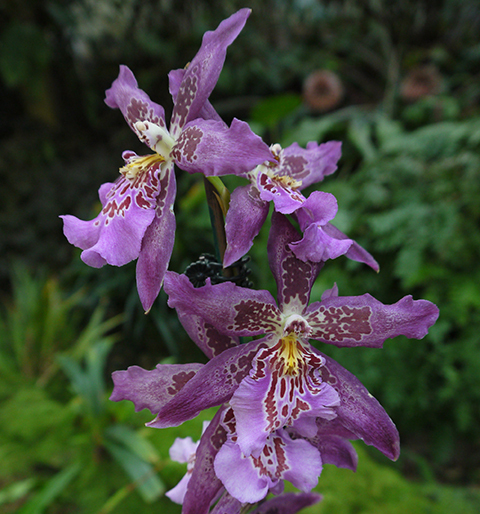 Beallara is the name given to the offspring resulting from a sequence of crosses between the genera Brassia, Cochlioda, Miltonia and Odontoglossum. Thus, Beallara is an intergeneric hybrid, as is the Doritaenopsis above, only more complex in its genetic background. I love the über-feminine look of these beallaras. They wear their frothy Odontoglossum lineage on their sleeves. Tahoma Glacier is pure white overlaid with rosy markings and a favorite of mine in a display where white is needed. 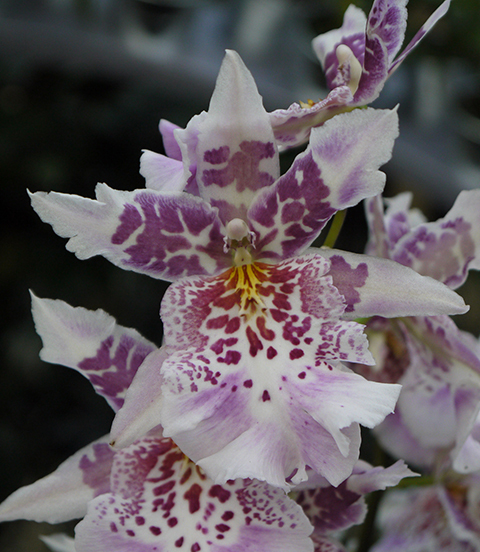 'Howard's Dream' is one of only a few Oncidium intergenerics with a large flower that reads purple, not red violet. One unfortunate characteristic of some Beallara cultivars is their extremely weak flower spikes. The spike will often break under the weight of its full complement of mature flowers unless it is staked along its entire length. We learned this the hard way, of course, after an entire bed of 'Howard's Dream' collapsed prematurely during Orchid Daze 2007. So, beware. If not staked 'Howard's Dream' becomes Howard's Nightmare. Finally, the diminutive Big Shot 'Kitty Kat,' which we just used to replace the 'Howard's Dream.' 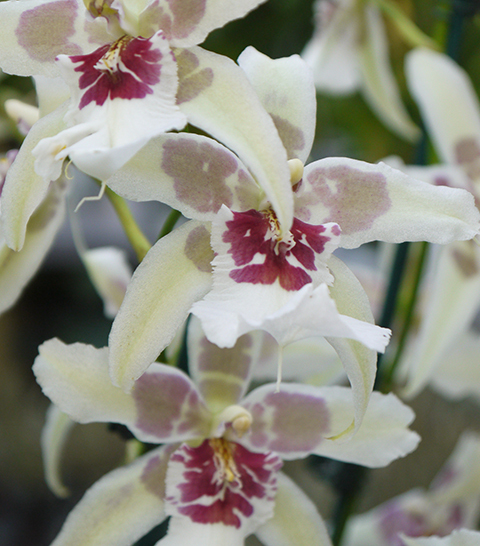 Most of the Oncidium intergenerics last about eight weeks in flower under our conditions. Since Orchid Daze lasts ten weeks we do a switchout at week eight. 'Kitty Kat' is a new variety for us and an unexpected delight. 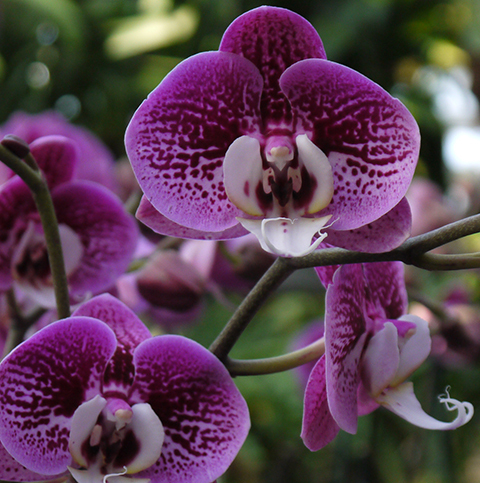 Sunday is the last day to see Orchid Daze 2012! We are open every night until seven pm.